Finding Thanksgiving-themed children’s books that are vegetarian-friendly can be a daunting task. Most are focused on dinner themes and images that most vegetarian parents would rather avoid, if at all possible. With A Turkey For Thanksgiving by Eve Bunting and Diane de Groat, the tables, so to speak, are turned. This holiday book focuses on a group of animals, including a moose, rabbit, and goat, getting a turkey to the table – but as a guest, rather than as a food source. Readers go along on Mr. Moose’s journey to find a turkey to join in on the celebration. The seemingly vegan feast on the table is then enjoyed by a joyous and diverse community of animals. The only downside to this book may be the moment when Mr. Moose is a bit harsh in putting his foot on the turkey’s head and then marching him, against his will, back to his home to partake in the feast. Overall, this is a good book for those looking to send a more compassionate message about Thanksgiving and eating vegetarian food for the feast. This book demonstrates that a group of diverse individuals can gather and enjoy Thanksgiving, without killing a turkey. 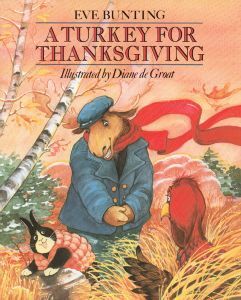 I want to like this book, but I don’t like how roughly the turkey is treated, especially the scene where the moose steps on the turkey’s neck. I don’t understand why such violence is necessary in a book about not eating turkeys.